A panel of women neurology chairs discuss the challenges of ensuring parity for women in academic neurology, and they offer solutions as well. On March 4, at a noisy hotel meeting space in which about 100 chairs of neurology departments throughout the United States were busily chatting while dining, the room suddenly emptied of women. There weren't many female chairs to begin with — around ten were expected to arrive for the first AAN Chairs Summit the following day — but when they left, the gender disparity was even more strikingly apparent. Neurology Today had invited those female leaders to a discussion on gender issues in academic neurology so we could find out why there are so few women in leadership in our field, what can be done about it, why we have one of the greatest gender salary disparities among all specialties, and much more. It was not the first time this subject had been discussed at the Academy. Two years ago, the AAN had created a gender disparity task force, which had identified causes for disparities in compensation, professional advancement, leadership opportunities, and work/life balance. The task force made a series of recommendations to the board of directors, which included improving transparency, addressing bias, developing mentors, and broadening education. Around the same time, a women's leadership program was formed with a subcommittee to provide oversight, and several courses have been developed for the annual meeting. The March summit was the first time women chairs had come together for an AAN-hosted meeting of their peers, and they were not shy about setting the record straight about their responsibility as female leaders and mentors, and the challenges that need to be addressed. “People sponsor and mentor people who are like them, and if there aren't women who are in the position to do that, to help other women get to really fulfill their potential, the problem is not going to go away,” said Robin L. Brey, MD, FAAN, chair of the department of neurology at the University of Texas Health Science Center, San Antonio, and president-elect of the AUPN. But the problem is complex, and there are a number of women who simply don't pursue leadership as a goal. “That is a very deep-seated societal issue,” Gretchen E. Tietjen, MD, professor and chair of neurology at the University of Toledo, said. “They often times have more burden at home and they just don't think they would have the time to put into that,” she said. Women also sometimes lack the confidence to take on a leadership position, whereas men seem to have less fear of failing, she added. “I think that young women need to see that people have made it through some of the obstacles that they perceive are there with respect to simultaneously growing a family as well as their career, and there are many ways to do it,” said Frances E. Jensen, MD, FACP, chair of the department of neurology at the University of Pennsylvania. Dr. Jensen also pointed out that in mid-career a lot of women will step away from such challenges. That happens because they may not be counseled enough about opportunities in their personal lives to ease some of the pressure, she said, so that they can continue their research or clinical careers. She noted that there are numerous kinds of leadership roles, not just chairs, but in clinical programs, research, mentoring and education, which women quite aptly fill. Kathleen M. Shannon, MD, FAAN, chair of neurology at the University of Wisconsin in Madison, said she felt fortunate to be working at an institution where half of the clinical chairs are women. She credits her dean who said to her during her interview, “When I look at your CV, I see the CV of a chair,” pointing out examples of her collaborative skills, a quality he values in chairs. But Claudia F. Lucchinetti, MD, FAAN, chair of neurology at Mayo Clinic in Rochester, MN, noted that executive presence is often appreciated differently in men than women. “I think some of the qualities that I sometimes see applauded in my male colleagues are almost held against a woman who is excelling through the leadership ranks, things like assertiveness, ambition, drive, passion, intensity,” she said. In male colleagues, these traits are viewed in a positive light, but they don't conform to the mold people expect for women, she pointed out. When there is incongruence there, it sometimes ends up reflecting negatively on the woman, especially as she moves higher up the ranks to the highest level, the C-suite. Such advances don't happen frequently in neurology. According to a 2013-2014 benchmarking survey of women in academic medicine, published by the Association of American Medical Colleges, the percentage of permanent women department chairs across specialties is 15 percent, but in neurology that figure is only 11 percent When asked to explain why we are behind, Dr. Jensen suggested that one reason for the lag is that up until two decades ago, neurology was very research-driven and there was only one way to succeed. “Now that we're actually at the point where we have translation, implementation, and opportunities for all kinds of leadership — not just research — it's becoming more of a diverse field, and I'm hopeful we are going to see more opportunities for women,” she said. Another reason cited for the paucity of female chairs are data suggesting that female neurologists are disproportionately more affected by burnout than males. “It is often the woman in the partnership who is doing much of the household and child-rearing activities, which can have an impact on how quickly you burn out at work,” Dr. Johnston observed. Often the way to advance involves making a geographic move, Dr. Shannon said, and women may be more reluctant to do so. Citing her own experience, she said that unless she had had an opportunity at her own institution, she would not have wanted to relocate for a new position until her son, who was in high school, was ready to move. Dr. Tietjen said she was surprised to discover how many women associate professors fail to become full professors. She noted that it is not only young women with new families that face challenges, but also mid-level women, who typically not only have to care for teenage children, but also elderly parents with new health problems. Dr. Brey said she is hopeful about the future, however. “It seems like the notion of diversity, inclusiveness, and value placed on leadership skills is becoming more of a norm at those highest levels — at the president, or provost or dean level — so I'm optimistic that if we can mentor our mid-career and junior women well, and really help them understand how to maneuver caring for children, caring for elderly parents, and having a career, that we're actually on the verge of having a shot to really turn this around,” she said. Several institutions are taking on that challenge. Childbearing years fall around the same time as the promotion timeline, Dr. Lucchinetti pointed out, so Mayo extended that time to be able to ensure that [women] could continue to follow that trajectory. They look at the accumulation of accomplishments, she said, not just the accomplishments over a certain period of time. The University of Wisconsin created a new position, associate dean for faculty affairs and development in charge of women's mentorship, who is responsible for the development of women faculty, said Dr. Shannon. And the University of Pennsylvania has a faculty opportunity fund for women coming in as assistant professor in a tenure track to get salary assistance, which incentivizes the chair to invite them to join the faculty, Dr. Jensen said. She also noted a “clock stop” program that is being utilized by women to great success in which they have a full year “off-the-clock” during the year they give birth. Dr. Johnston said the University of Virginia had a time “off the clock” program as well, which is not just for maternity and childbearing but also can be for caring for elderly parents or for a sick child, so that women don't get behind in their academic productivity during the time they have something else that is demanding their attention. Dr. Brey said that they also achieved parity in her institution after her previous dean insisted that chairs perform a salary review and provided them data on gender equity in salary. Louise D. McCullough, MD, PhD, professor and chair of neurology at Memorial Hermann Hospital–Texas Medical Center, said: “That's something you have to watch as a chair because sometimes if you ask a man and woman [to serve on an educational committee, for example] the woman is very likely to say yes. So, in a way they are kind of making it harder for themselves when you look at RVU-based metrics because that takes them out of the clinic,” she continued. She said chairs need to remind themselves to take a more equitable approach. Elizabeth H. Morrison-Banks, MD, MSEd, health sciences clinical professor at the University of California, Riverside, advised that young and early career women need to seek out mentors to have conversations about packages before they lock themselves into a lower salary bracket at the start of their career that will follow them throughout their career. Dr. McCullough said the same applies to female translational research scientists, for whom the startup packages tend to be much smaller. “I found that women are a little more tentative about asking, and we have to change that mindset — that we are worth it, the lab is worth it, the clinic is worth it — and they need to ask up front for higher salaries,” she said. Dr. Johnston suggested that everyone needs to be armed with the salary data from the Association of American Medical Colleges that provide the median salary by geographic region. “That has led me throughout my career; you don't wait for someone to tell you what you're worth, you tell them what you're worth,” Dr. McCullough said. “That's something we have to tell women to learn how to do better,” she added. •. Report of the AAN Gender Disparity Task Force: https://www.aan.com/gender-disparity-report. •. The 2013-2014 state of women in academic medicine: The pipeline and pathways to leadership from the women in medicine and science (WIMS) benchmarking survey. AAMC: http://bit.ly/aamc-report. 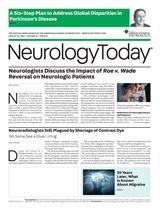 Neurology Today18(8):12-14, April 19, 2018.